How Do I Tell If the Hibiscus Bush I Just Bought Is Perennial or Tropical? Perennial hibiscus plants are also called hardy hibiscus plants. The main difference between hardy and tropical versions of the plant are the temperature requirements. The tropical hibiscus requires a warm climate year-round. Whereas the hardy hibiscus can tolerate cold weather -- dying back to the ground during the winter months, and then shooting up again in the spring. Knowing the type of hibiscus plant you purchased allows you to care for it properly. If you live in a cold climate, expect to take extra measures to protect your new plant. Inspect the leaves of your plant. Deep green leaves with a high gloss signify a tropical hibiscus. Heart-shaped, dull-colored leaves signify a hardy hibiscus. Check the flower color of the plant. Hardy hibiscus flowers have red, pink or white flowers, according to the Tropical Hibiscus website. Tropical plants have bright salmon, peach, orange or yellow blooms. Inspect the shape of the flower. 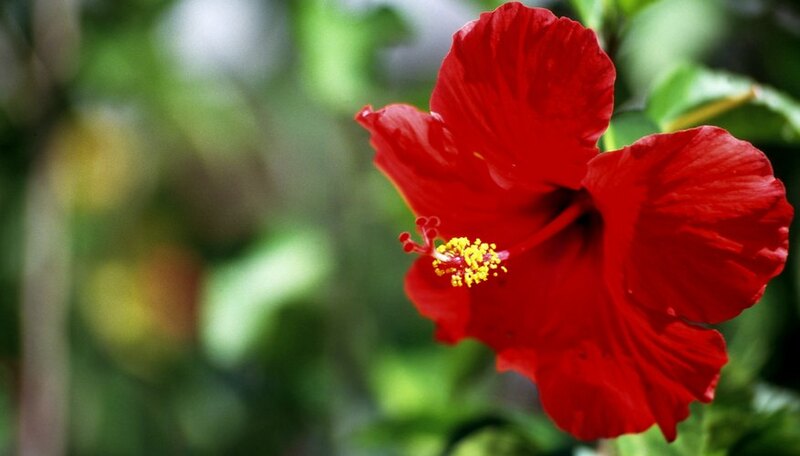 The tropical variety has double flowers, while the hardy hibiscus has large buds in the center of its flowers, averaging about 2 to 4 inches in size. Consider the current season and where you bought your hibiscus plant. If it's cold outside and you purchased the plant from an outdoor display, you have a hardy plant. The tropical hibiscus needs warm weather or a greenhouse environment to survive. Hidden Valley Hisbiscus: What Kind of Hibiscus are These?